Whatever you do to stay in shape—lifting weights, running, CrossFit, or team sports— discover these tips that can help you do it better. It’s been said that the best kind of exercise is the one you’ll stick with. So whatever you’re into, we won’t judge you (unless it’s prancercise). Rather, we want to help you do it to the best of your ability. We looked at the most popular methods guys use to get in shape, from weight training to pickup basketball, and drew up a plan to help you excel at them. If your main source of exercise is regular pickup games with your buddies, we’re going to guess that basketball is the one you play most often, given its year-round accessibility. While the tips that follow are geared primarily for increased performance on the court, boosting speed and explosiveness will change any athlete’s game for the better. These skills begin with your vertical jump. “Do box jumps once a week,” says Jason Ferruggia, a strength coach in Los Angeles who’s worked with more than 500 athletes. Find a stable box or platform that’s challenging to jump up onto and perform three to five sets of one to three reps. Rest up to two minutes between sets. Swing your arms back to begin each rep, dip your hips, and then reverse the motions quickly and use the momentum to help propel you onto the box. Land softly (try to make your landing quiet). If you already weight train, place the box jumps at the beginning of your lower-body workout. However, “if you’re playing basketball four times per week or more, don’t bother with them,” says Ferruggia—you’re getting plenty of practice jumping as it is, and may risk injury by doing more. To build court-specific speed, sprint from baseline to half-court and then rest two minutes. Repeat for 10 to 12 total sprints. “As far as conditioning goes,” says Ferruggia, “I’ve always been a believer in playing yourself into shape.” Competing in your sport two to three times per week for at least 30 minutes should be enough to build your endurance. High-top sneakers that provide extra ankle support were popular in the ’80s and ’90s but are giving way to low-tops or midrange sneakers now. “When you essentially put a cast around your ankle, the stress of running and turning gets transferred elsewhere,” says Ferruggia. Namely, your knees, hips, and lower back. Less-supportive sneakers like a Converse Chuck Taylor allow your ankles to work at stabilizing themselves. 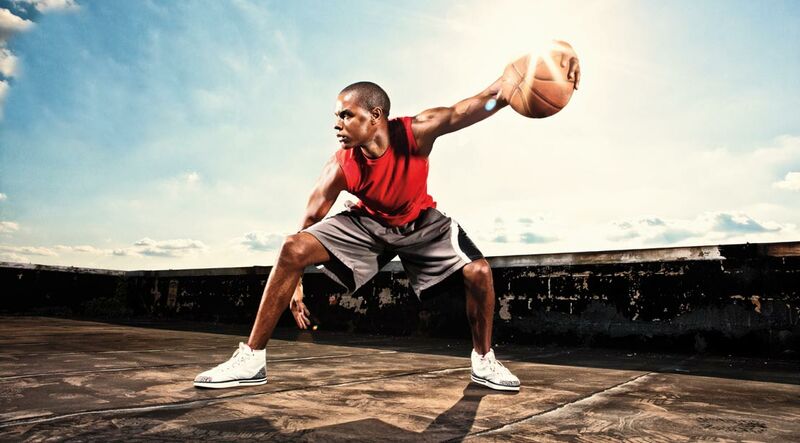 Tip: If you already play basketball three times a week, don’t bother doing separate cardio workouts. Running causes muscle tightness throughout the lower body, so you need to work on it regularly with a foam roller. Key areas to hit are the quads, hip flexors (the muscles at the top of your pelvis), and IT bands (along the sides of your thighs). Roll these parts with the foam and hold any particularly tender areas until you feel them begin to release—do this before and/or after runs. You can also take preventive measures to protect your knees. The vastus medialis, the muscle on the inner side of your quads, acts as the main stabilizer for the knee joint. You can strengthen it with the Peterson stepup. Set up a small box or step that’s about eight inches off the floor and stand to the left of it. Bend your right knee and place the ball of your right foot on the step (heel raised). It’s OK for your knee to be in front of your toes. Extend your knee to step up onto the box as you lower your heel to the surface, but let your left foot dangle. Perform three sets of eight to 10 reps on each leg and work to raise the height of the step over time. Running is progressed by reaching a total weekly mileage. This should include runs done at different tempos, or paces. Day 1 can be a slower-paced jog for a longer distance—around five miles. The next day can be faster, where you look to complete your distance—say 2½ miles—in a shorter time. This combo wins races. Tip: Keep your knees high, body relaxed, and focus forward when running.